Many parallel crystals of dark red huebnerite up to 4.5 cm long running though white quartz crystal matrix. The huebnerite crystals are all terminated and translucent red color is easily seen where the section is thin. Ex. Al Sebela collection. Overall size of mineral specimen: 5x3x2 cm. 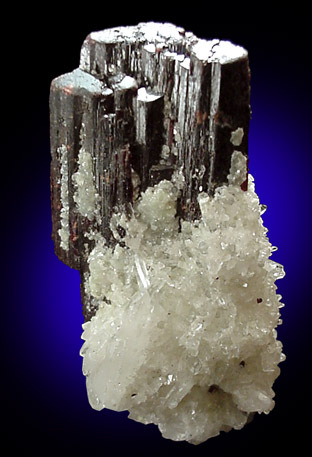 Size of individual crystals: 4.5 cm.